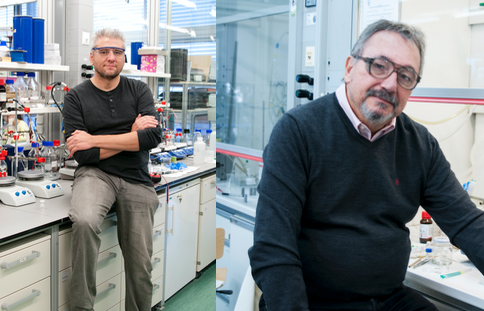 The work of two ICIQ group leaders has been recognized by the Spanish Royal Society of Chemistry (RSEQ, for its initials in Spanish). ICIQ group leader and director, Miquel A. Pericàs has received the Gold Medal as recognition to his professional career – the highest distinction given by RSEQ to scientists carrying out research in the field of chemistry since 1958. “I believe any prize given to people working at ICIQ is a recognition to the institute as a whole. I’m very grateful for this award which also acknowledges the work of colleagues and collaborators!” quips Pericàs. José Ramón Galán-Mascarós has been recognised with the RSEQ’s Award to Excellence in Research, given to scientists which during the last years have been doing outstanding research in chemistry. This year’s international awards, given in collaboration with our sister societies in Portugal and Israel, highlight the work of our David Milstein, from the Weizmann Institute of Science. The awards will be given at an official ceremony that will be held in Madrid in November.